Teaching learning-diverse students, English learners (Els), and students with disabilities has become of paramount importance as it relates to each unique student's need, directed by an Individual Education Plan (IEP), 504, English Language Plan, and related services, especially for those students served primarily under the Individual Disabilities Education Act. The students' unique cultural and familial needs also become important used to promote achievement in both the F2F and online educational setting, inclusive of multiple intelligences (MI), learning styles, and appropriate differentiated instruction. 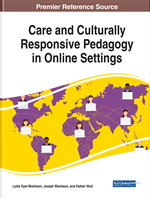 As such, the purpose of this chapter is to examine the learners and the diversity that they bring to the online learning community so that instructors may prepare culturally responsive and inclusive pedagogy and online universally designed learner-centered (UDLC) and differentiated practices that include them beyond their disability or exceptionality and to become culturally responsive instructional leaders (CRIL). As online teaching transforms what higher education looks like for many students, so too are the students transforming how they learn and together practitioners are examining what learning looks like for all students. Especially important are some of the learning diverse students, many who bring with them diverse learning and instructional needs that require accommodations and supports within the online and or distance educational classroom (Hardy & Huang, 2011; Heitner & Jennings, 2016). The literature has rarely engaged what culturally responsive or inclusive teaching and pedagogy looks like for online learners who possess special education, linguistically diverse needs and or exceptionalities (Woodley, Hernandez, Parra & Negash, 2017). Additionally, instructional practices must be constructive and co-create a learning environment that entails more than just break out rooms (BORS) and synchronous and asynchronous instruction; but instead must include sacred spaces where learning diverse students from culturally and linguistically diverse (CLD) and exceptional backgrounds can garner the supports that they need in order to be more fully included within all aspects of the online learning classroom (Taliaferro, 2011; Tan et al., 2010; Yi, 2013). Overall, the during last decade institutions of higher education have seen an increase in online teaching platforms, many that utilize Blackboard, Moodle, D2L and now Canvas (Keengwe & Kidd, 2010). To this end, very little literature has examined the intersections of the learner with this evolving technology including their ‘special needs’ that are often encapsulated within legal parameters such as the American Disabilities Act (ADA), Section 504 and at the K-12 level, the Individual Disabilities Education Act (IDEA). Students who possess these learning differences are often presented with supports for services and face to face (F2F) assistance across their K-21 experiences that focus on the tools, not the conceptual features of the online classroom space. As such, it is not uncommon for many students with learning disabilities at the higher education or post-secondary education level to avoid online learning altogether for fear of the unknown (Hardin & Huang, 2011). However, given the advent of K-12 online cyber schools and now pop-up online district programs, each has in kind also produced a large number of technologically equipped online learners who also possess learning-diverse needs, in addition to learning disabilities (Chuang, 2016; Hardin & Huang, 2016; Heitner & Jennings, 2016; Sleeter, 2012).